In Downtown, Hamill leads us on an unforgettable journey through the city he loves, from the island's southern tip to 42nd Street, combining a moving memoir of his days and nights in New York with a passionate history of its most enduring places and people. From the Battery's traces of the early port to Washington Square's ghosts of executed convicts and well-heeled Knickerbockers; from the Five Points, once the most dangerous and squalid slum in America, to the mansions of the robber barons on 'the Fifth Avenue'; from the Bowery of the 1860s, the vibrant heart of the city's theater world, to the Village of the 1960s, with its festival-like street life, this is downtown as we've never seen it before. Hamill weaves his own memories of Manhattan with the liveliest moments from its past, and points out the hints of that past living on in the city of today, fueling the ever-present nostalgia of its inhabitants.Hamill introduces us to the New Yorkers who have left indelible marks: Peter Stuyvesant and John Jacob Astor, Stanford White and George Templeton Strong, Edith Wharton and Henry James, Joseph Pulitzer and William Randolph Hearst, W. H. Auden and Allen Ginsberg, Boss Tweed and Fiorello La Guardia, Jimi Hendrix and Thelonious Monk, and scores of others. And he takes us to the eateries, saloons, theaters, movie houses, bookstores, and street corners they, and he, once frequented, whether still standing or existing only in memory. 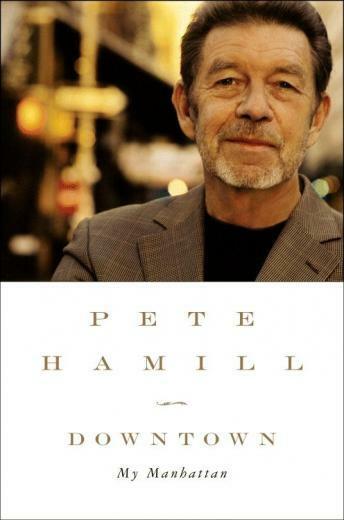 Through the city's transformations, the pulse of Pete Hamill's brilliant voice melds with the pulse that drives New York, that mixture of daring, greed, anger, rebellion, hope, entrepreneurialism, and longing that never fades. Written by native son who has lived through some of New York City's most historic moments, Downtown is an extraordinary celebration of the magnificent, haunted place that Hamill continues to call home, and that people from all over the country and the world have come to call their own.